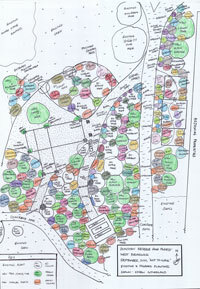 You may not know about this amazing food forest, right on your doorstep with 30+ mature productive food trees. A terrific companion to the community garden next door, it provides a stable, long term perennial counterpart to the garden's mostly seasonal, transient, plant-harvest-replant cycle. This unique place will only get better as it becomes more established and we locals invest some love and attention. You can also read a bit more about it here. Our project to rejuvenate the food forest has been underway for a year now. For a bit of a boost at the end of this rebuilding phase and to spread the word about whats happening down at Dunstan Reserve, we're teaming up with the incredible Permablitz crew (if you haven't come across their work, check it out). We're inviting lots of friends to help give us a push over the line and prepare the food forest for a soon-to-be-established band of dedicated food forest rangers (more on this soon). There'll be lots of us there, come and be a part of it. We'll provide a great lunch for everyone who comes to help (RSVP to grow.eat.moreland@gmail.com so we can cater).